This month we celebrate two Holy Days associated with ‘Abdu’l-Baha: His Ascension and the Festival of the Covenant. In this issue we feature the Life of ‘Abdu’l-Baha – please click on the title of the articles you’d like to read. Why Do American Historians ignore ‘Abdu’l-Bahá? Mrs. Gibbons, a Bahá’í, had written the Master before His coming to the United States, requesting that her own daughter be allowed to paint His portrait. In His reply He consented to this request and added, according to Mrs. Gibbons, that Juliet Thompson would paint a portrait of Him. Juliet Thompson had long dreamed that she would paint the face of Christ. During the month of June, ‘Abdu’l-Bahá allowed Juliet Thompson to paint His portrait telling her to paint His “Servitude to God”. She completed it over the course of six sittings which took place over multiple days in different rooms. Juliet remembered that fourth sitting on June 19th because of an extraordinary experience she and Lua Getsinger had on that day. As the Master prepared to sit for the portrait, He turned to Lua Getsinger who was also in the room and told her in Persian that these sittings made Him sleepy. He sat down and closed His eyes. Juliet studied Him but found that she could not begin painting because ‘Abdu’l-Bahá’s countenance reflected the dignity and peace of the Divine Realm. A great joy seemed to fill Lua while Juliet wept at witnessing this extraordinary moment of spiritual force flowing through the Master. Then ‘Abdu’l-Bahá became quiet again. The Holy Spirit receded, and ‘Abdu’l-Bahá the man re-emerged. He smiled at Juliet and told her that she must stop crying since she would not be able to paint through tears. In the afternoon of that same day He sent Lua Getsinger downstairs to speak about the Covenant to the visitors waiting there. When He went down later, He read from Bahá’u’lláh’s Tablet of the Branch and spoke with great power on the Covenant. ‘Abdu’l-Bahá designated New York City, the “City of the Covenant”. This book is a collection of talks given by ‘Abdu’l-Baha during his historic journey to North America in 1912. His teachings on the Eternal Covenant will help everyone appreciate the way God has guided mankind by sending Divine Messengers. In honoring this Covenant, we bind ourselves to our Creator and keep our own promises to walk the “mystical path with practical feet”. Whether Baha’i or not, this is an indispensable book for broadening our understanding of religion, spirituality and our purpose as human beings. 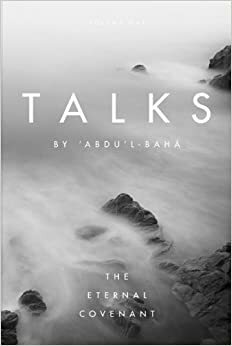 The clear, concise and breathtakingly profound manner in which Abdu’l Baha communicates is so inspiring, enriching and manifest that even 100 years after they were given, they still bring energy and understanding to modern day problems. James Mohajer is a singer/songwriter and cover artist with a passion for music. He plays all the instruments in his videos. Julie Walker is an intuitive with a specialty in medical issues. You can ask her all types of questions about health and wellbeing, but also anything that is on your mind about your life, family, or work. She can help discover what is going on in your body, even when the doctors are baffled. It’s vital to prepare ahead of time by writing down clear questions that you have about your physical, mental, emotional, and spiritual wellbeing. She stays very booked, so it often takes weeks to get an appointment. If you have an urgent need, be sure to communicate that when you contact her office and request to be fit into any cancellation that happens. To make an appt, call her assistant Karen Bermann-Mazibuko, 773-517-4637, or email kbermannmazibuko@ gmail.com. You may want a bit of rest and reflection time right after the appointment, so try not to schedule your life too tightly up against it. In addition to her work as a medical intuitive, this month’s featured coach, Julie Walker also runs a business called The Oneness Model where she offers a model for human development and evolution which is an organic way of looking at how everything is connected to everything else. It explores the human experience through five main human “cultures” (survival instincts, spirit, heart, intellect and oneness), and shows how if we have beliefs that cause distortions in us within any of these cultures, we are blocked from our evolution, and the great role we play within the collective. Most of us carry some false beliefs about who we believe we are, who we are meant to be or become, and who we are not. The same beliefs hold true in our assessments of those we encounter in and around us in life. These are part of a collection of beliefs we term “core lore”, and the Oneness Model books and workshops are a way to help us see these in ourselves, and in others, so that we might eliminate what is false, and restore what is simple truth. Julie is regularly invited as a guest speaker or to lead classes or workshops in order to provide deeper insight into the Oneness Model and explore paths to healing and self discovery. Thanks Janet and Azita! Your encouragement means a lot! Each of these newsletters takes about a day a month to research and upload. I’ve noticed a steadily declining “open rate” and “click rate” over the past few months, which makes me wonder about the wisdom of continuing. If you’ve found these newsletters useful, I’d love to hear which sections work best for you; and any suggestions you have to make it more relevant and useful.